Gravity Flow version 1.1.2 is now available via auto-update and for download from the account page. In addition to fixing some bugs, this version and adds important new features and support for the upcoming releases of new major versions of two important Gravity Forms Add-Ons. Gravity PDF v4 is still in beta it’s already fantastic. If you haven’t tried it yet I suggest you do. Gravity Flow 1.1.2 adds support for the upcoming new version while maintaining backwards compatibility with version 3. If you have Gravity PDF v4.0-beta2 or greater installed you will see an additional setting for each of the approval emails (assignee, rejection and approval). The setting allows you to attach any PDF from the list of available PDFs in the form settings for Gravity PDF. You may have noticed in the above screenshot that the settings for the from name, from email, bcc, reply-to and subject. These settings have been added to all the workflow emails to bring them in line with the Gravity Forms Notifications settings. 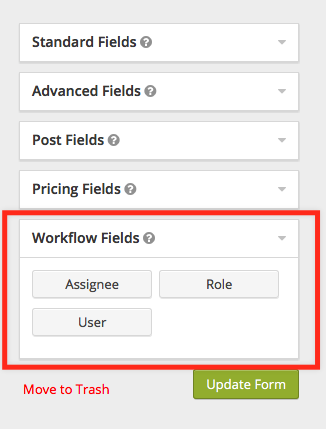 Two new fields have been added the User Field and the Role Field. These fields work like the Assignee Field which has been removed from the form editor and deprecated. The User Field displays a Drop Down list of WordPress user accounts and the Role Field does the same with the roles. The deprecated Assignee Field will still work and so will your custom code, but please keep an eye out for a removal warning in future versions. – Added options to the workflow email settings: From Name, From Email, Reply To, BCC, Subject. – Added support for Gravity PDF 4. – Added the Workflow Fields section in the form editor. – Added the User field. – Added the Role field. – Added schedule date to the workflow entry detail for queued entries. 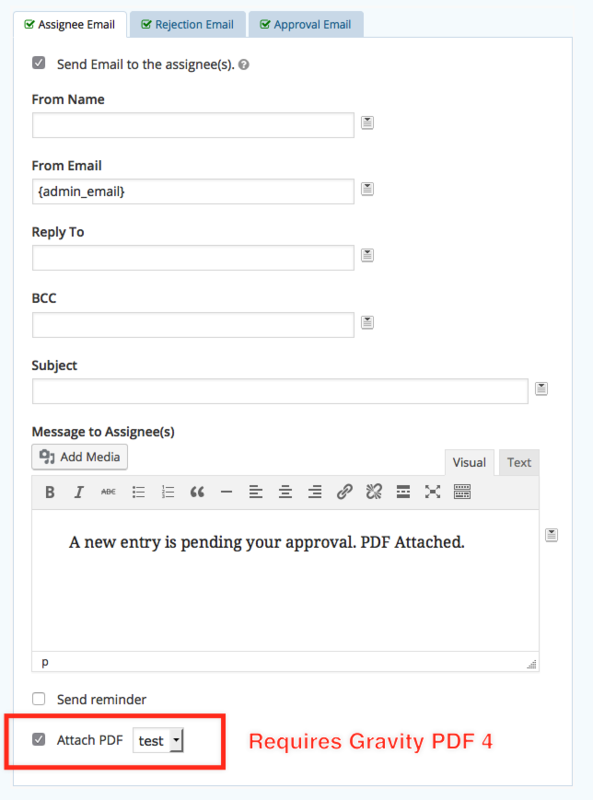 – Deprecated the Assignee Field and removed the button from the form editor. – Updated the default number of users returned for settings and for the assignee field from 300 to 1000. – Fixed an issue with the schedule date setting for installations in timezones < UTC. – Fixed an issue with the schedule step setting where the values are not retained after changing the step type. – Fixed an issue with the assignee by month report where the axis labels were switched. – Fixed an issue with the status export where the created_by column is missing for forms submitted by anonymous users. – Fixed a compatibility issue with the Gravity Perks Limit Dates Perk.